Leading Australian horse trainer Dr Andrew McLean is the founder and senior vice chairman of the HELP (Human Elephant Learning Programs) Foundation, as well as the CEO of Equitation Science International. He is this week’s Changemaker. McLean possess a rare combination of both academic and practical talent. He has been a top international equestrian competitor, an equestrian coach for more than 30 years and has a degree in Zoology and a PhD in equine cognition and learning. He is also a prolific author of books and journal papers on the science and ethics of horse training, and has won Australia’s most prestigious science award, the Eureka Prize for Science in 2011. 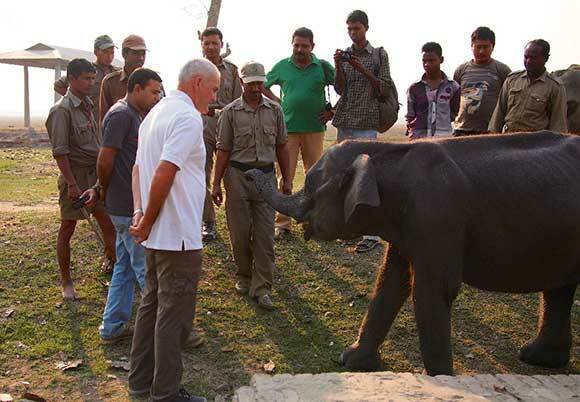 His journey with elephants began in Nepal in 2007 when he constructed a training program for mahouts and elephants based on the same scientific learning theory blueprint that he had developed for training horses. And so the HELP Foundation was born, bringing together a team with various expertise, with the aim of teaching mahouts to train elephants humanely and more efficiently for their crucial role in anti-poaching. 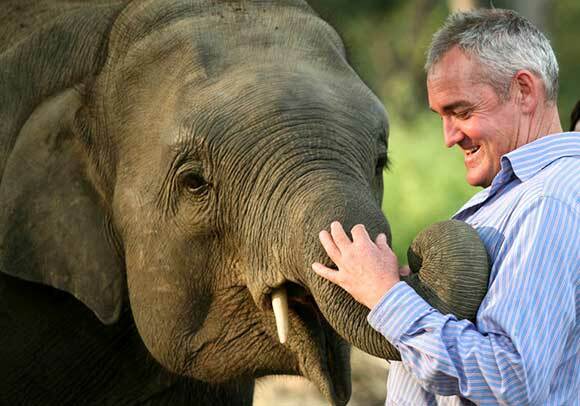 In this week’s Changemaker, McLean talks about his grandmother, how anyone can learn to train an animal, why elephants are like a cross between a labrador and a horse and why he is amazed by the planet we live on. 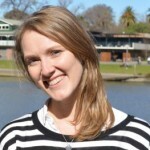 How did the HELP Foundation (Human Elephant Learning Programs) come about? First of all, it came about because of my work with horses, where I teach people how to train horses in a more ethical way by understanding how they learn and… then basically hijacking learning processes and incorporating it into training purposes, so it makes the learning much more efficient and it also cuts down on stress. There was a woman from Finland who had been in Nepal working for WWF and she had seen how difficult the training is for young elephants, it is fairly stressful. And that’s not just in Nepal, it’s true right across Asia, and in fact it rings quite similarly to the way people even train horses in the West, where they believe the animal just has to be submissive and the implication is you don’t need to teach it much, you just have to make it submissive and it automatically knows what it has to do. For example, in horse texts there is very little text on how to train, but there is a lot of text on how to ride and it’s the same with the elephants. So she saw the treatment of the elephants, where they were doing all of these coercive things to make them submissive, and thought that she would look for a better way to do things. First of all I went to Melbourne Zoo and got a little bit of familiarity with elephants with a fellow there called Laurie Pond, who is an excellent elephant trainer and just a generally good trainer. So he familiarised me a lot with basic elephant behaviours and requirements in zoos and so along I went to Nepal. What was really surprising for me was when I got to Nepal, how tall the elephants were compared to the zoo ones! That’s likely because of Bergmann’s Rule, and Bergmann’s Rule basically states that the further you go away from the equator, the given species just tends to get bigger and bigger as you get towards the poles and the Nepalese elephants of the Indian elephant species are the tallest in the world, so I was really a bit overwhelmed by the size of them. But I was dealing mostly with the young ones, say three to five years of age, and we already had in that group of people a very good trainer from Finland who also came, who trains animals for commercials and has had a lot of experience with birds and other species, and she had already developed many of the elements of positive reinforcement that we continue to use today, you know using food reward. And I developed the way we would use the pressures on the elephant skin to elicit responses, so what I did was really just combine her work with my work and that was the beginning of the HELP Foundation. Because most of the elephants I’ve been involved with in the HELP programs are for anti-poaching, catchers poachers, as well as wildlife surveys, they are exposed to tigers quite often. And most elephants will panic when they see a tiger, they become quite anxious, but the elephants we trained were braver in those circumstances because they hadn’t had the coercive early training. It’s a bit like if you punish children, it’s very hard to make them be the child that stands up for injustice later, if they’ve had a really unreasonable punishment background. A lot of your work focuses on teaching mahouts to train elephants humanely, how does this fit into the wider picture of preventing poaching? It fits in really nicely because our work with the governments has been with forestry departments and the Wildlife Trust of India work with the forestry and the biggest issue in these national parks is poaching, you know the killing of rhinos and tigers and elephants. And elephants are just easily the best vehicle to track them down because a) they’re quiet, b) they’re an all terrain vehicle, they will go where no vehicle will go, perhaps save an army tank and even then they are probably better because they swim really well, they go through swamps, they’re excellent on unstable ground, they don’t ever panic they will just quietly test the ground and they also have this remarkable sense of smell, which is many, many times greater than a bloodhound. So what we’re hoping to do with our HELP Foundation as we grow bigger and stronger is to incorporate the work of a woman from Tanzania in training the elephants to smell poachers so they can help find them themselves, with a rider on their back. And the sorts of things that she has suggested that we would train them to do is maybe smell gun oil, because the whole trunk is invested with olfactory cells so I think that wouldn’t be so difficult for an elephant. And she has also been involved in training rats to sniff out landmines, so that’s one of the things we’re looking at for the future, but certainly the poaching is a really big problem because it is just rife right across Asia and Africa. We haven’t moved into Africa yet but we’re hoping to. Through your work, what is your ultimate dream? We’re on the verge of achieving tax deductible status and that’s been quite a step forward and the lawyer who has helped us Alex Lilley has done an amazing job getting that going for us and he did it all for nothing. We’re right on the verge of getting it and when we do, I think our funding level will increase and we’ll be able to move into Africa and perhaps fulfil our other big dream which is to build mahout schools. Because, mahouts right across Asia are typically of the lowest social class and in Nepal the lowest caste, and so naturally when you have got such a low caste your outlook isn’t great, I mean you don’t have good pay, you’re overworked, there’s not enough money, there’s a lot of alcoholism, an awful lot of domestic violence and so you can’t really, I don’t think, have very good animal welfare standards if you don’t have good human welfare standards… so we’re moving into Myanmar and Thailand in October as well with our program, and I’ve already written a book on this method of training, it is basically a manual, you can hold an elephant in one hand and the book in another and hopefully you would be able to ride it by the end of the week and that’s been very successful in India. And in our mahout training schools, we’re hoping to teach them all the elements of training but also economics, so they can manage their financial affairs, and every aspect of elephant management and pretty much everything involved so then the government would see that there is a very valid vocational path there and they’ll be more justified in being given promotions… We’ve got a politician in the north that is very keen to assist us there. But these are all our dreams for the future, that’s what we’re hoping to do. It’s a long aim. I mean ideally the way I see elephants, I would rather have all elephants returned to nature because they’re not a domestic animal but the reality is there are 14,000 working elephants in Asia and this is not going to change immediately because of economic circumstances in these various countries, so it just means we need to be doing something in the next 50 years before these countries can afford to put the elephants back to nature and use bobcats or use whatever else they might use to do their work. When you first started working with mahouts did you meet any resistance? There was a bit of resistance but you see because the death rate is so high from PTSD [post-traumatic stress disorder] type symptoms that arise from the elephant being coercively trained in the start, that it lives with them in their subconscious for life and sooner or later, many elephants will turn on their handler, when the mental challenges and stress are really high, so the death rate was enormous. It was something like, in the state of Kerala alone there is two mahout deaths every month and so with that kind of death rate, there is not a single workshop I ever do where most of the people don’t know of someone close to them who has been killed by their elephant, so that gives you quite a motivation to try new things. The other thing that I’m really impressed about is, when I work with horses, I work with the wealthiest people in the world by and large, because a horse is used for sport. And when I work with the elephants I’m working with the poorest people in the world and the poorest economy and it’s very interesting to draw conclusions there…you wonder about western education because the mahouts are much more keen to take up new information, they are much more open minded than horse riders are. So it takes me much longer to convince many riders that they can do things better and they can be more efficient in their training than the elephant people who are really keen to give it a shot and sit back and work it out, so there is very little resistance. But we also have a few tricks up our sleeve. When we are first showing them what we do, we quite often will do something that is going to blow their minds about how efficient it is, for example teaching the elephant to pick up objects with its trunk and hand them to the mahout using positive reinforcement, you know, using food reward and the elephant rarely takes more than 20 minutes to be doing that, whereas they take a longer time because they use punishment. You can’t really punish an animal for doing something that it’s got no idea what it’s meant to be doing. Look I always think from a layman’s point of view they are something like a cross between a labrador dog and a horse. And that could be doing them a disservice. They do seem to be very intelligent. They are very socially intelligent. And because they’ve got a trunk that, I think, makes things different compared to other grazing animals, most grazing animals have fairly similar mental abilities, in my work in animal cognition, that’s what the research shows, but elephants are a standout because of this trunk. Because when you have a tool using mechanism, then you need to develop planning abilities, like forethought and visualisations, to know what you’re going to do with that particular thing you are going to pick up. You need to imagine things ahead whereas if you don’t have those abilities everything is immediate and right before your eyes. So yeah, they’re quite smart. They do some interesting things, for example if we are training the elephant to sit, it’s not unusual for the elephant to walk away but sit somewhere else because he has just chosen a more comfortable place. Those things are always fascinating to see. You seem to possess an unusual combination of both academic knowledge and practical animal training, winning awards on both sides of the coin with a Eureka Prize for Science and being a top international equestrian competitor, what’s the relationship between theory and practice? Does one come first? Well for me, the practice came first because I was a horse rider and then I started to become curious. I was already a zoologist anyway, so I had a little bit of an idea to what was going on but not enough, and so I started to embark on this PhD and so that came first for me, but it doesn’t really matter what comes first. It is unusual. I think in the world there are very, very few people in the horse world, I don’t really think there is anybody else that I know of, that has that level of experience in the practical side in horse sport competitions, and the academic side, I have just been very lucky and fortunate that I can move in that area. It was really just curiosity that lead me to it, I never planned a life like that, I simply just was curious, I wanted to know how I could teach these horses what I wanted in a much better way. Just the contact with the animals. But also, I really like the people too. I think you can’t really love animals without loving people as well to be honest, because I think it’s somewhat even fraudulent to only [love animals] because if you’re tough on people you sort of use punishment on those people by humiliation or whatever and you don’t have enough empathy for people, I think it is very difficult to stretch your empathy to animals. You’ve really just got to like living life and animals and people in general I think. But animal systems really impress me, I am just amazed by the planet we live on, you know there is such amazing diversity and that we can actually do the things we do, with these animals. Well the biggest challenge is our finances because as a foundation we do our best to raise enough money. We’re a Not for Profit organisation of course, and our aim for fundraising is to raise enough funds for airfare in general and accommodation and that is really the only thing that stands in our way. If we had sufficient funds, and we are hoping this will happen with our tax deductible status that we’ll be able to really fulfill all of those dreams. There is no practical reason why it can’t happen. There is no theoretical reason why it won’t work and there is certainly no lack of need for it in the world, it’s really, absolutely urgent now because I think it is the best approach for poaching apart from the use of drones. A colleague of mine, Laurens de Groot in the Netherlands, he has a company in Africa that uses drones for locating poachers but you’ve still got to get there and capture them, whereas if you’re on an elephant you can get there quietly and there is no limitation as to where you can go, so I think there is a lot of possibilities with the use of drones and elephants together. I think that could work extremely well. That’s a hard question, I suppose, it’s hard to say but I am inspired by people like David Attenborough, he’s probably my greatest inspiration in the animal world and the world that is interesting to me. And there have been some very ethical horse trainers around that I’ve been impressed with, like Tom Roberts from South Australia, he’s now dead, I’m actually writing a book about his life at the moment. And I think going back before then, my biggest influence was my grandmother. Because she really had a huge influence on my life and my commitment and my belief in myself and she lived to be 106 so, I was very fortunate. She was a very, very grounded and confident person. She set up in the depression a shop selling first of all newspapers and then she developed a library and then she further developed it into a music store. When she went to Gordon and Gotch to buy newspapers they said they weren’t going to be selling newspapers to a woman and she said “why not”, and they said, “well what makes you think that a woman can ever sell newspapers,” and my grandmother said to them, “well, what makes you think a woman couldn’t”. And then they said “well you’ve got the job”. And she ran her life like that… she was a really sympathetic person, all the neighbours loved her and she was just very good with people, so I think I learned a lot from her influence and just seeing how she behaved. Our parents died when we were in our twenties so even though I had my parents I didn’t have them for that long, whereas she was around for much longer. Do you have a favourite saying? One of the favourite sayings I have in training animals is, I say to people, if you train a bird to sit on your arm, you’ve got to let go of its wings. Because what often happens, is when people think they’ve trained horses and elephants, they’re always annoying it, and keeping pressures on. In horseriding it’s much worse, you know they’ll hold the horses face with very tight reins and its mouth may be open and its tongue is trying to get out showing the pain but they just do the nose bend up more and more tightly and that’s quite common, and at the same time, while they’re pulling on the reins which are the breaks, they’re also kicking them with spurs and that’s just really [opposite] to what training is. And I try and explain that because it is just such bad welfare for the horses and many of those horses don’t survive for long, they don’t live a long healthy life, they die early of gastric disturbances or something else. Can anyone be taught to train animals? Yes, that’s the thing, anybody can, it’s really easy. The technology of it, is not that complex. Of course, like anything, if you want to make it very thorough, then learning theory is huge and you can do a whole degree in it, and it can get quite complicated. But the basics of it enable you to train an animal to be secure and obedient and safe. It is not difficult, it’s easy enough to teach people which is why I like doing it. 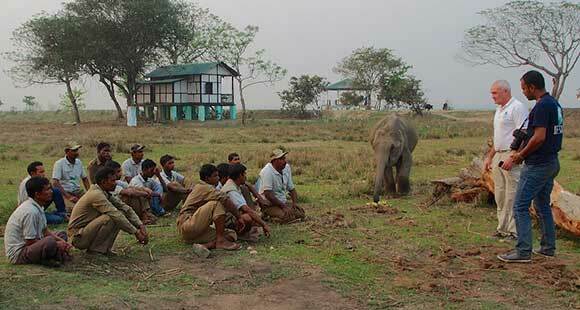 I mean the learning mechanisms that we teach these mahouts are really relatively simple. It’s just how they use their pressures on the animal’s body, where they use them, the timing of removing them and then the use of positive reinforcement to enhance the response and help solidify the response and there’s not a whole lot more to it than that, because all you’re doing is teaching animals through cues to alter its mobility, to go faster, or slower or stop or step back or step sideways and turn, and apart from those aspects the only other thing is teaching it to use its trunk correctly so pick up things and of course we also teach them to help the rider get on because they lift their leg up and the mahout might stand on the elephant’s knee. But it’s all the same learning mechanism so there’s nothing new, it’s just a different behaviour. Do you have a preference for working with horses or elephants? I really enjoy both. When I am working with a horse for a long period of time, I always think, oh it would be nice to have a change with the elephants. I think the only thing is with the elephants it’s a little bit more of a dangerous situation because wherever elephants are there are always mosquitoes and there’s a lot of malaria and dengue fever and Chikungunya, and I’ve had dengue and Chikungunya and you can’t really afford to get them twice. So I take a lot of care, as much as I can, but you are in the jungle for long periods of time. So this time for example, when we go to India in October and then Myanmar and Thailand, you know, we’ll be in the jungle for a couple of weeks so we’ll just really have to be careful about mosquitoes. In many cases the people who are native to those regions are somewhat immune to them. But no, I am just very fortunate to have a life that I love doing. The HELP Foundation is returning to their existing programs in India this October and then continuing on-to Thailand and Burma to commence two new programs and begin the next stage of their work in the humane and evidence based training of working elephants. For their 2016 fundraiser, HELP are hosting an afternoon of nibbles and drinks on 18 September where Dr Andrew McLean will share some of his experiences along with his motivations, ambitions and the successes he’s had since founding HELP. All donations enable travel and accommodation.